A deep grey wash finish makes The Whitney Electric Fireplace Entertainment Package by Napoleon, stand out from the rest. Includes the Cinema-inch Glass 24 Electric Fireplace, this mantel package is modern and subdued, blending perfectly into your space. The transitional design makes it perfect for any room, living, dining, and anything in between. A smoked glass top, and media storage provide ideal housing for your entertainment equipment. Enhance your space with this plug and play, fireplace option. Distinctive styling and functionality make the Hudson media fireplace a standout. This electric fireplace can accommodate today's flat screen televisions up to 60-inch and electronic components. This unit includes a media shelf to hold your components with a built-in wire management system. The two side cabinets include adjustable shelves to store your CDs and DVDs. The mantel is easy to assemble and is constructed from wood solids and veneers with a durable and rustic brown finish. The fireplace heats up to 400 sq. ft. and includes a multi-function remote control with temperature and timer functions built in. Distinctive styling and functionality make the Muskoka Mackenzie media fireplace a standout. 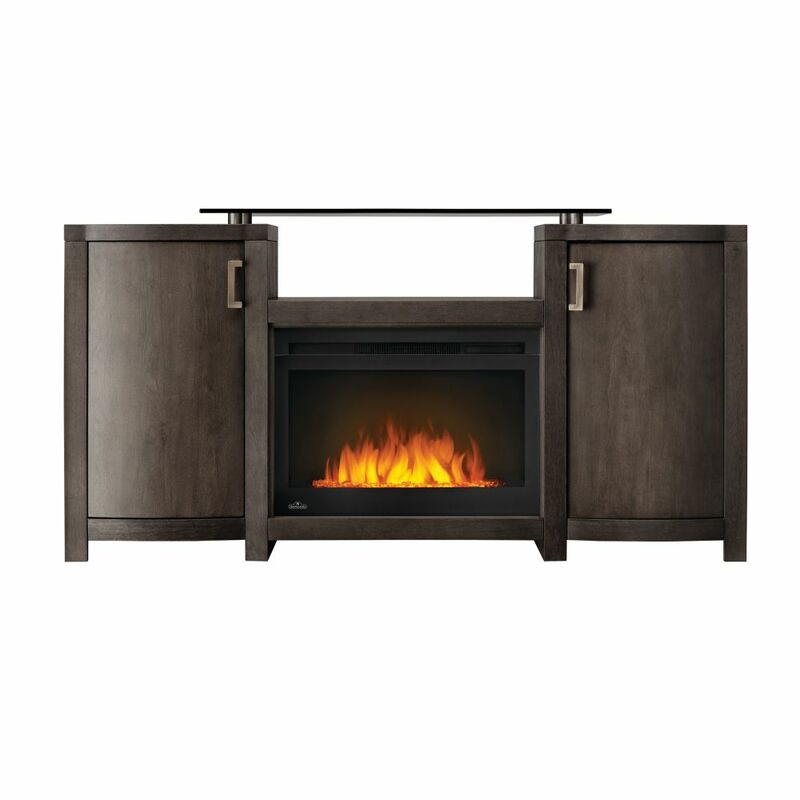 This electric fireplace can accommodate today's flat screen televisions up to 50-inch and electronic components. This unit includes a media shelf to hold your components with a built-in wire management system. The (2) side cabinets include adjustable shelves to store your CDs and DVDs. The mantel is easy to assemble and is constructed from wood solids and veneers with a durable and light weathered grey finish. The fireplace heats up to 400 sq. ft. and includes a multi-function remote control with temperature and timer functions built in. Whitney Electric Fireplace TV Stand with Storage, 24-inch Firebox, Grey A deep grey wash finish makes The Whitney Electric Fireplace Entertainment Package by Napoleon, stand out from the rest. Includes the Cinema-inch Glass 24 Electric Fireplace, this mantel package is modern and subdued, blending perfectly into your space. The transitional design makes it perfect for any room, living, dining, and anything in between. A smoked glass top, and media storage provide ideal housing for your entertainment equipment. Enhance your space with this plug and play, fireplace option.